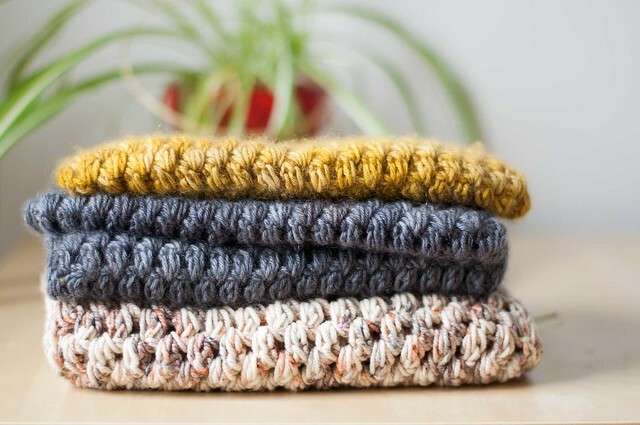 These days I’m all about the mindless knit most of the time (while reading), with more complex stuff thrown into the TV time (where I can actually look at a pattern). Easy-peasy: log cabin-ing! My handspun log cabin is growing and dude, I love it. I’ve already added another layer+ since I took this photo. And it’s actually using up balls of handspun! I’m doing 10 ridges in each section, but if I run out of a colour I just add a couple ridges the next time I’m on that side to make up for it. I want this one pretty big, and I’m already starting to think that I might have to actually spin yarn for it. I’m already planning another out of pakucho cotton, maybe double stranded on huge needles for even more fast-ness. In other fastest-ever news, I’m progressing so fast on the handspun top-down I showed yesterday that the next post about it will likely be an FO! I’m done the body and neck edging (just some single crochet), a sleeve, and am working on the other sleeve. Here’s hoping I divided that yarn equally, and the second sleeve will be the same length as the first one. Hooray for using up stash! That’s a great use of random balls of handspun! What a great idea for handspun! Oh I love it! Excellent colorscheme. Can’t wait to see the finished project! That is such a great idea. Now that I’m spinning I have been wondering what to do with small amounts of handspun!!! Thanks! very pretty! i love all the different colors you’re using. yum……….when your married I ment. not now, oh no just practice now. Wow, that looks great! I love those colors. So cool that it’s out of handspun. Wow, I love your log cabin…I’ve been wanting to start one for ages and you’ve really inspirede me to get going :o) Love the colors you’re using. I LOVE your hand-spun log cabin. its gorgeous. I recently did a pillow cover log cabin in kureyon leftover, but your own handspun! wow. this is a good incentive to start spinning! oh laura, it looks absolutely wonderful! Lovely work! Any chance of getting a pic of the reverse side of the Log Cabin?